Here's your chance to do battle with the Spammish horde that hides behind my mail icon every morning. Tell me you like the site. Tell me you don't like it. Tell me my nose looks like a big, flat mushroom cap. Or suggest a way to make the site better. Fill in some sparkling detail that I've missed. Share your opinion on an album or artist -- I'll add it to the discussion. A few items of very minor interest... Progrography receives several thousand visitors a day. I do review CDs by new, unsigned artists, but I'm awfully slow about it. Equitable, even charitable, but slow. And I proudly make less than a dollar a day from this site (although I may publish a book some day that contains these reviews plus the scads of release info that I don't put on the web site). 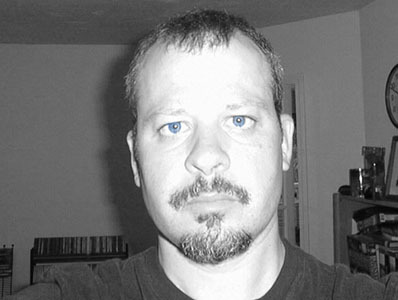 This is a gray-and-blue photo of me. I had intended it to be black and white, but apparently I don't have much of either color in me.